According to all eyewitnesses, J.D. Tippit was shot no later than 1:06pm. 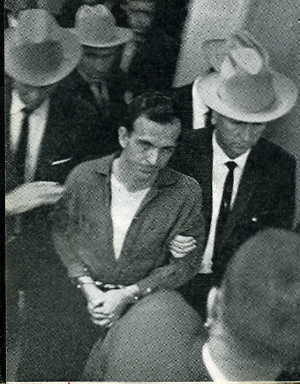 Oswald was standing outside his apartment at 1:04, 0.8 miles from the scene of the murder. So the Warren Commission needed to add ten minutes to the time of the murder to get Oswald at the scene by 1:16. Even that’s a stretch; covering 0.8 miles in 12 minutes (4.0 mph) is very fast walking. This lie was standard operating procedure for the Commission. Witness testimony and physical evidence which proved Oswald’s innocence was ignored or altered to fit the Lone Gunman myth. Note: The death certificate from Methodist Hospital signed by Joe B. Brown lists the time of death at 1:15. The police supplementary offense report states that Dr. Liguori pronounced the officer dead at 1:15. An FBI report dated 11/29/63 that states that Dr. Liguori pronounced the officer dead at 1:25 PM looks like it originally said 1:15 and was changed. Did the Warren Commission tell the truth about anything? It did not mention that bullets recovered from Tippit’s body were from an automatic and Oswald had a revolver; or the vast majority of Dealey Plaza witnesses heard or saw shots from the Grassy Knoll. It never mentioned the Zapuder film; or the impossible Magic Bullet which entered JFK’s back 5.5″ below the collar and never exited; or the JFK Limo coming to a full stop; or the “double-bang” of nearly simultaneous shots; or the evidence that Oswald was standing in the Doorway: Billy Lovelady and Wesley Frazier both testified numerous times that Lovelady was standing on the steps in front of Frazier and that he (Frazier) was standing on the TOP level entrance – as was Doorman (Oswald); or the fake Oswald backyard photos; or the 7.65 Mauser initially identified by 5 Dallas police morphing into a Mannlicher Carcano; or why no record of Oswald ordering or taking delivery of the Carcano; or that Oswald was a $200/month FBI informer and CIA asset. And the clincher: they expect us to believe that Oswald ran from the 6th floor to the second floor lunchroom in 75-90 seconds, seen holding a coke and cool as a cucumber. That’s almost as bad as Oswald’s 2 minute one mile sprint to the Tippit scene. Faster than a speeding bullet. Sure. One fairy tale after another.